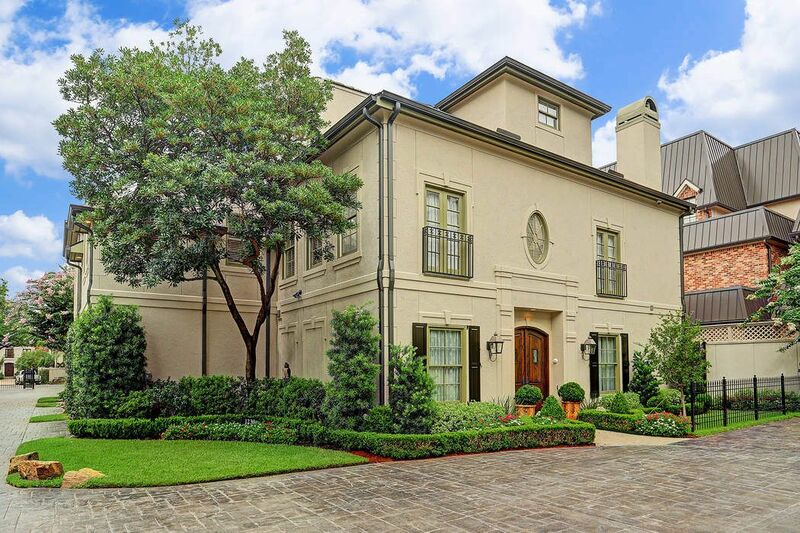 1239 Wynden Oaks Garden Drive, Houston, TX 77056 | Martha Turner Sotheby's International Realty, Inc.
A closer look at the double, solid mahogany doors, gas lamps, paver walkway and lush landscaping shows the pride of ownership of this meticulously cared for home. 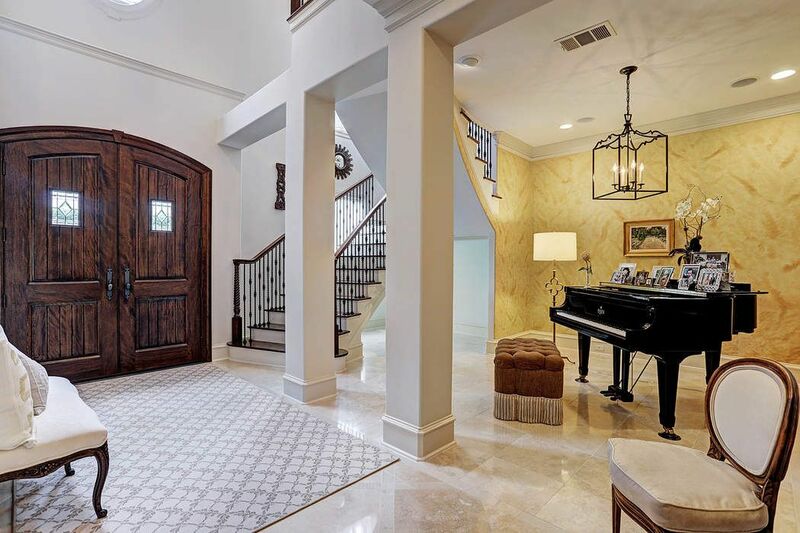 As you step inside, you will see the open reception area, handsome staircase with wood treads and wrought-iron spindles, travertine flooring and high ceilings. 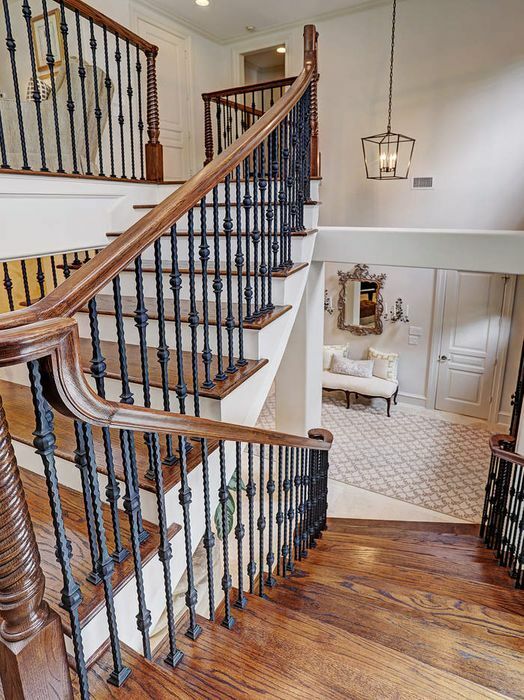 This vantage point illustrates the wide staircase fitted with wood treads and tasteful wrought iron work. The door in the center of the photo is the elevator capable closet that leads to the second floor. But, for now, it serves as generous storage space. 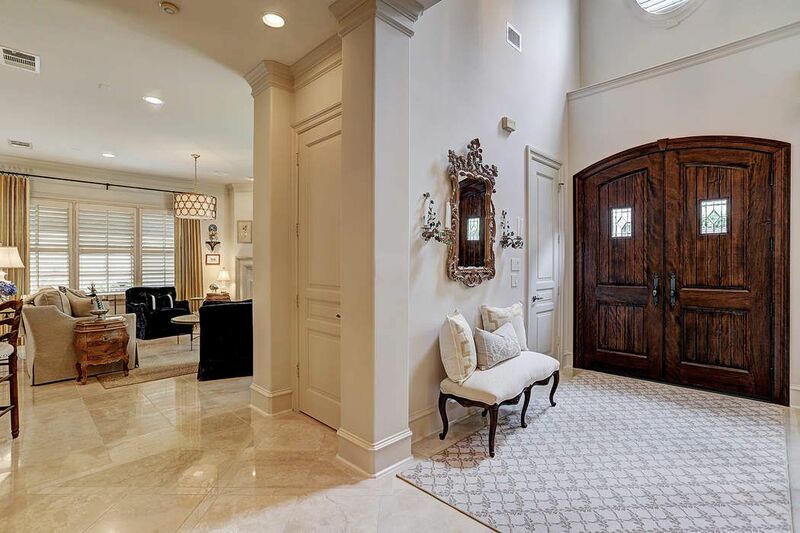 The door in the right of the photo is a powder room for guests. 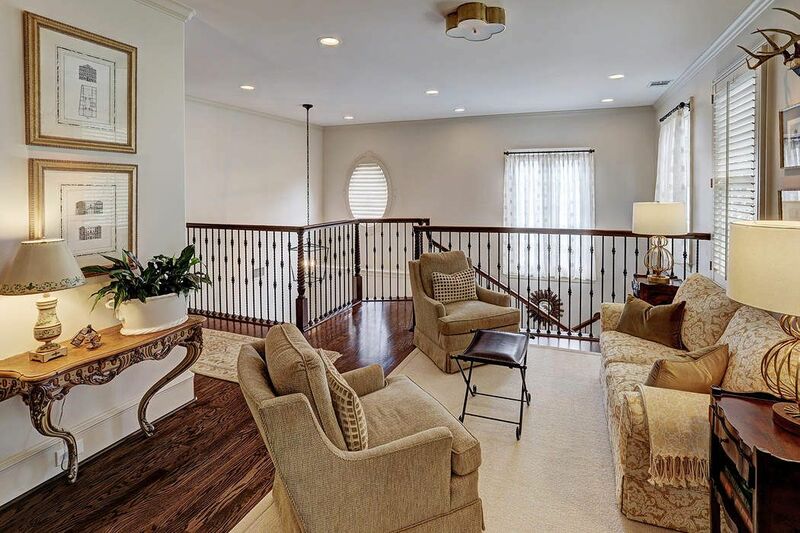 This perspective of the living space shows the proximity to the foyer and formal living space. In the foreground is the wet bar and and further the dining area. The wall of plantation shuttered windows overlooks the patio. 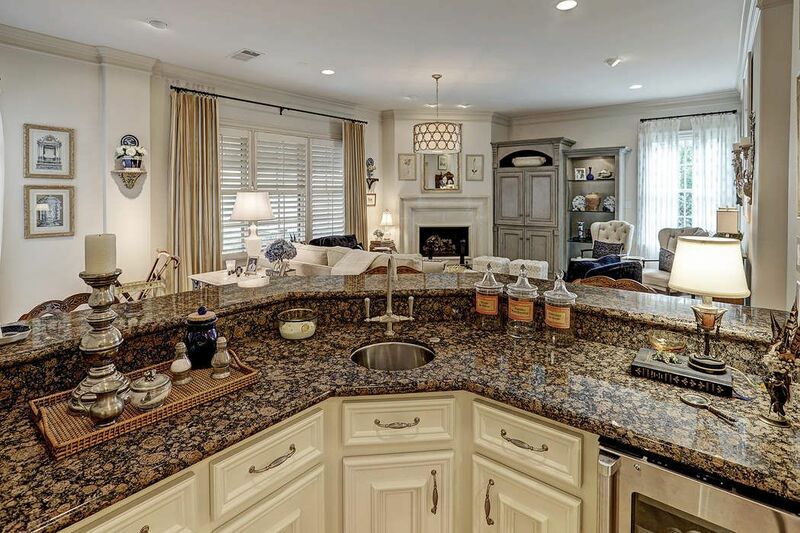 What a fantastic entertaining floor plan. 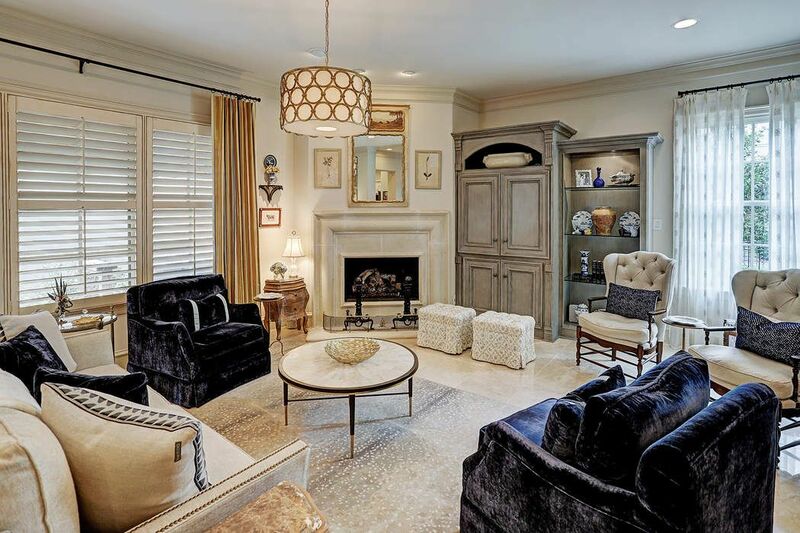 The cast stone gas log fireplace serves as a centerpiece for the room and the plantation shuttered windows are framed by custom draperies that overlook the private patio. The spacious dining area is open to the kitchen and living space. 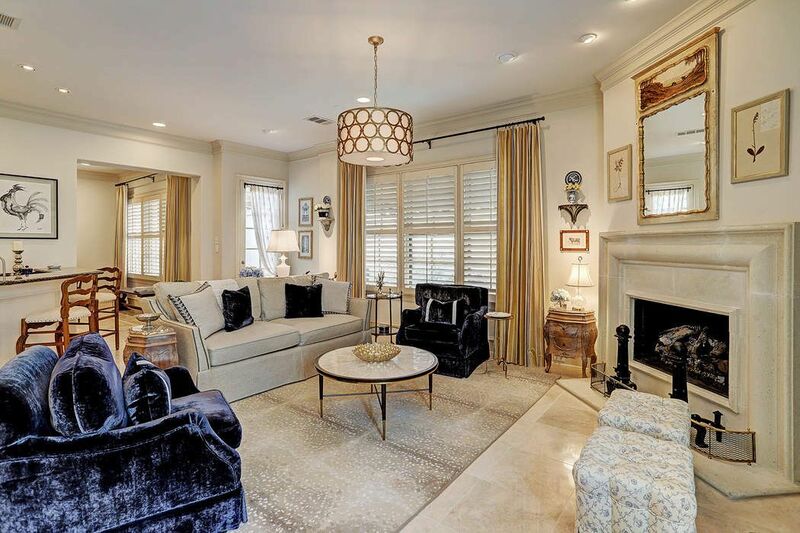 Plantation shutters overlook the patio and the elegant chandelier adds a bit of sparkle. Notice the wet bar fitted with a Marvel beverage chiller. 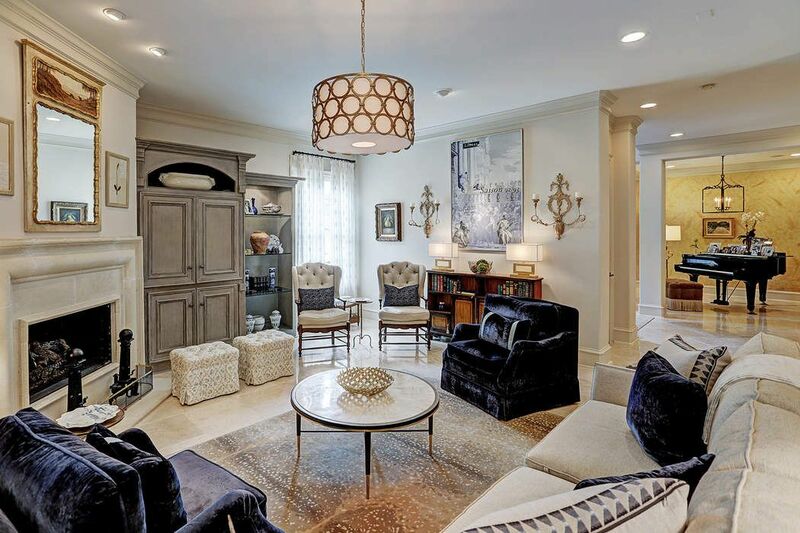 Just imagine hosting a dinner party in this refined space just off the gourmet kitchen. 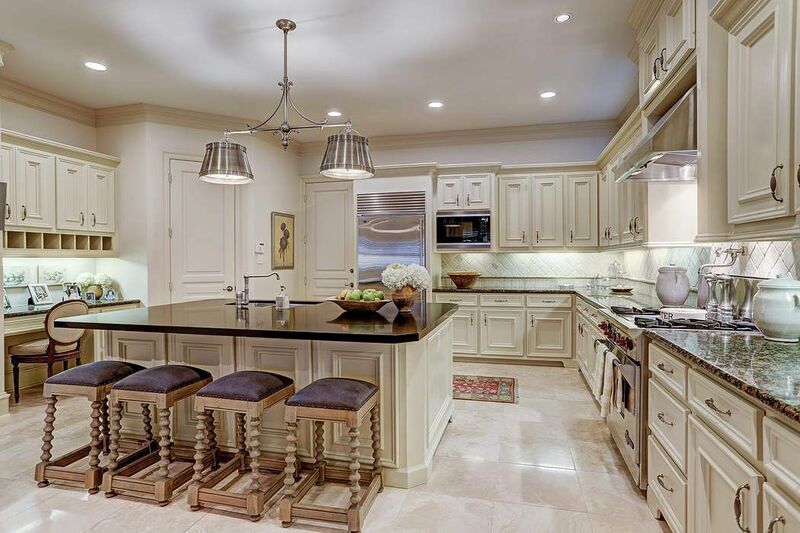 Spacious gourmet kitchen with honed granite island has abundant storage, Sub-Zero refrigerator, Wolf range, Miele dishwasher & Wolf microwave. 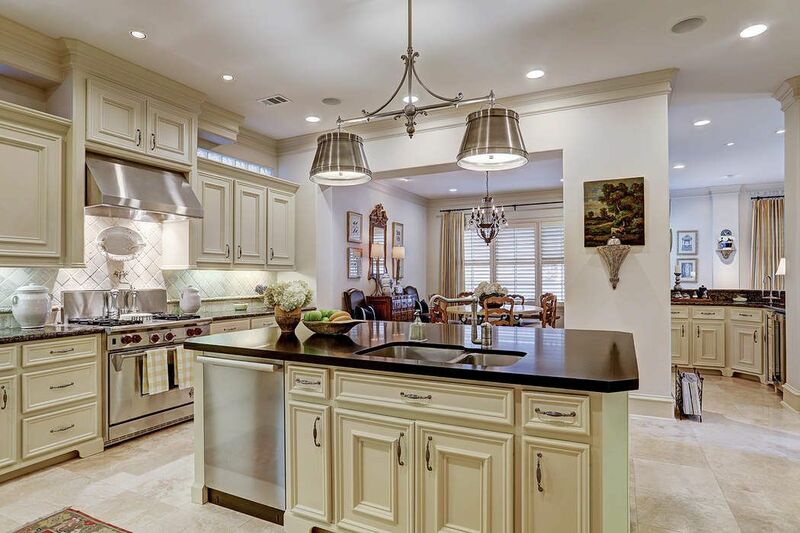 A generously sized pantry and chef's desk provide an extraordinary place to gather and cook. 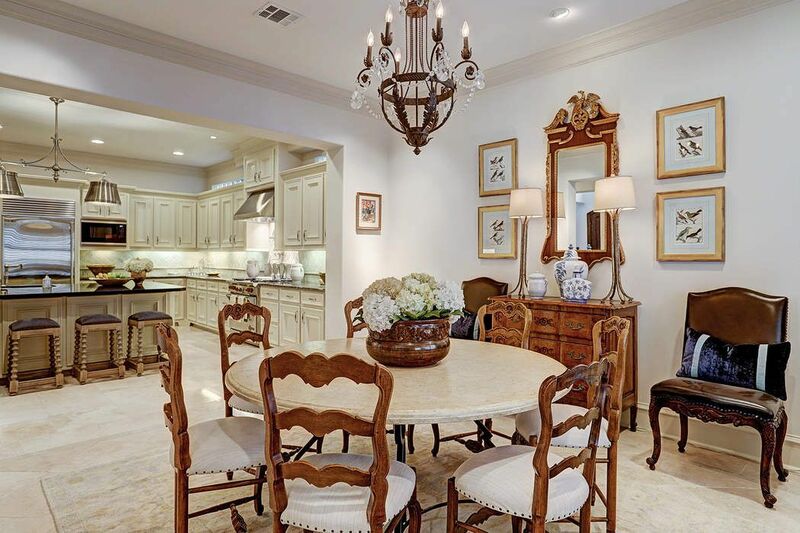 Elegant double chandelier casts light on your creations while high-end appliances afford ease in this spectacular work space. 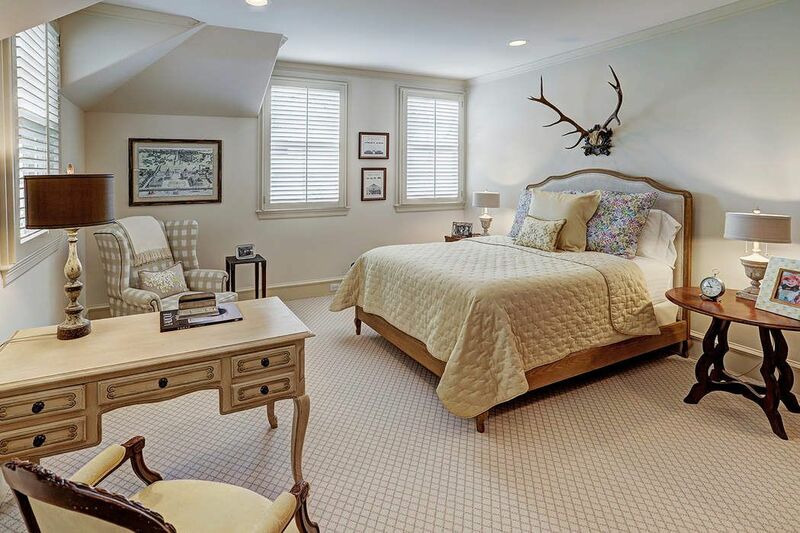 Gracious master suite boasts granite and cast stone gas log fireplace, 100% wool needlepoint carpeting, speakers and natural light from the plantation shuttered windows. 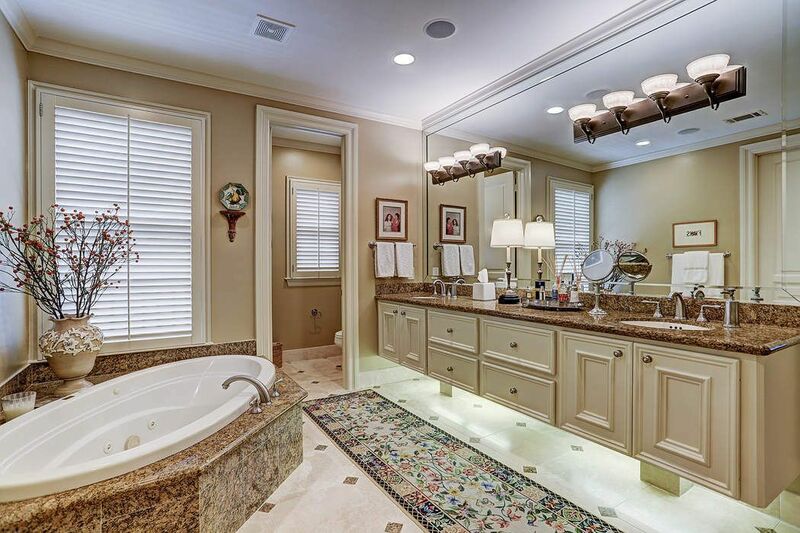 Master bath has raised cabinetry with under mount lighting, large soaking tub with granite surround, granite counters, double under mount sinks and private water closet. 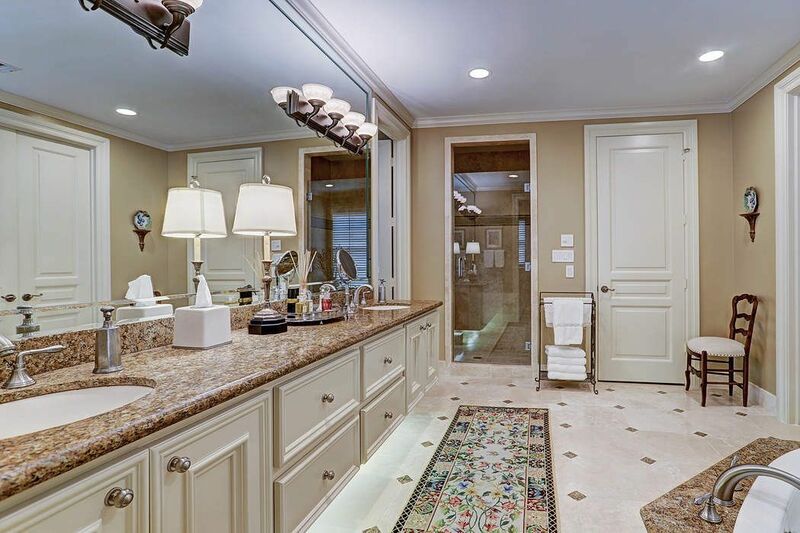 This vantage point in the master bath displays the generously-sized master shower and one of two closet entries. 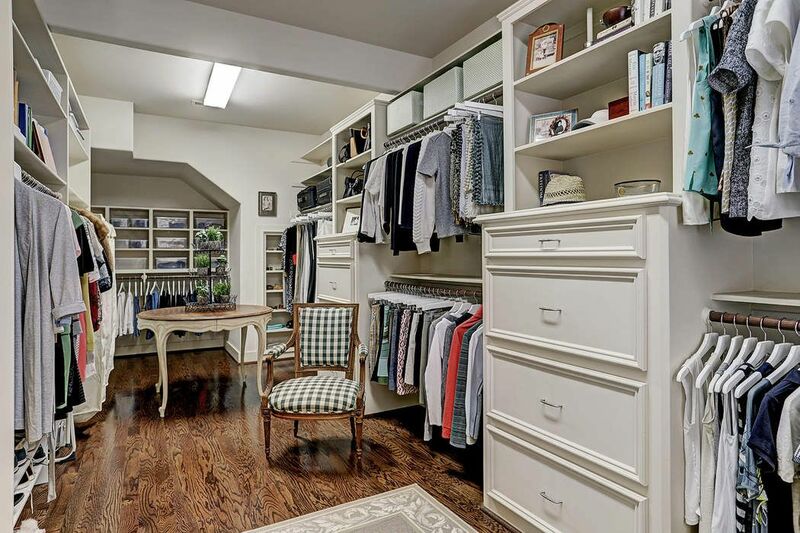 One of two closets has hard-wood flooring, automatic lighting, built-ins and room for clothing for all seasons. 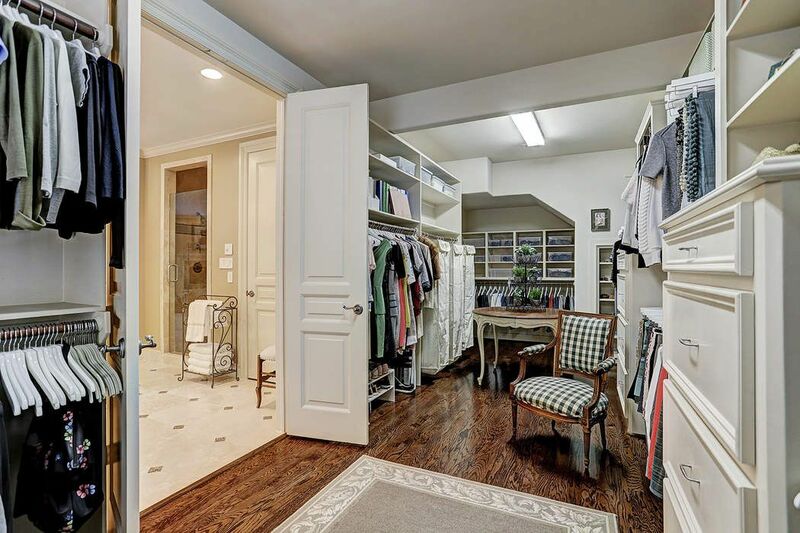 A closer view of the second closet displays the many alternatives for organization. 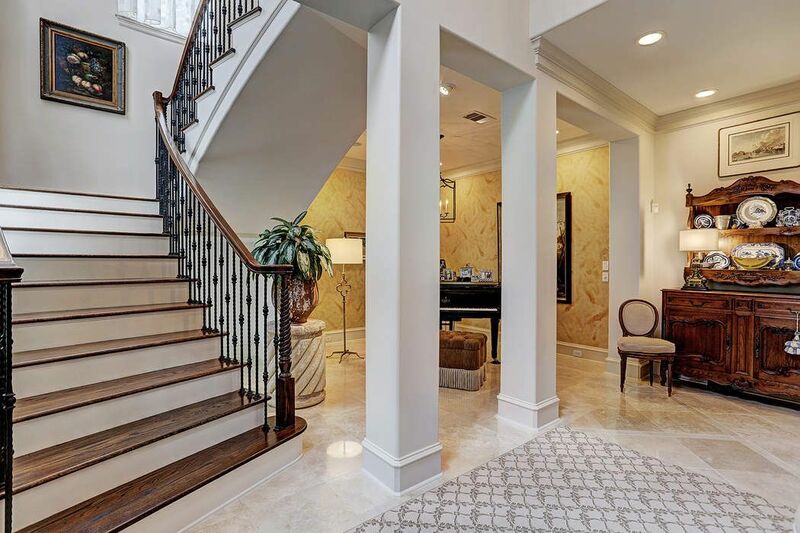 This graceful staircase is the centerpiece of the home leading to the bedrooms and open sitting area. 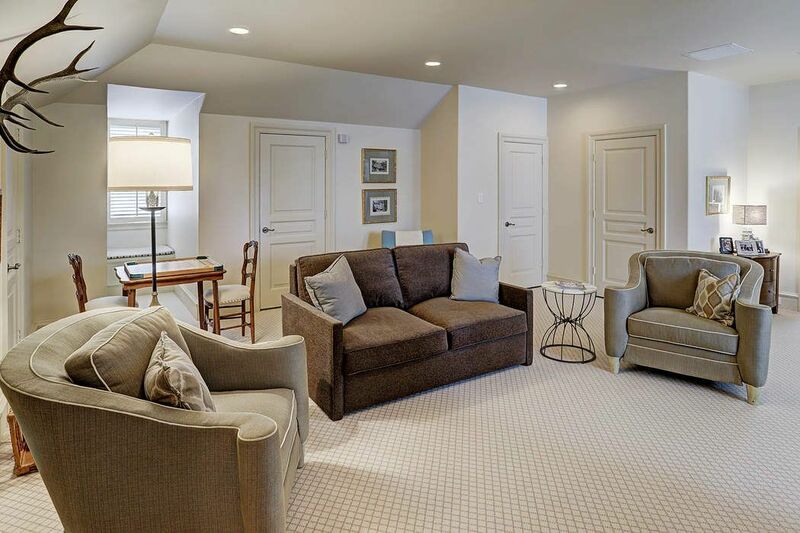 Can you imagine lounging and visiting with your overnight guests in this very special sitting area overlooking the stairway? Another view of the sitting area shows the secondary bedroom and the stairs to the third bedroom or flex space. 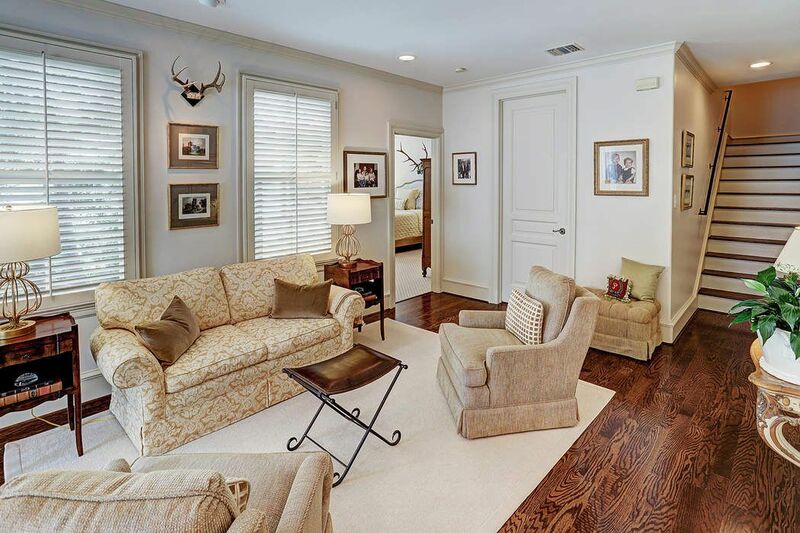 Notice the gorgeous wood floors! The first secondary bedroom has plantation shutters, 100% wood needlepoint carpeting, en suite bath and considerable natural light. 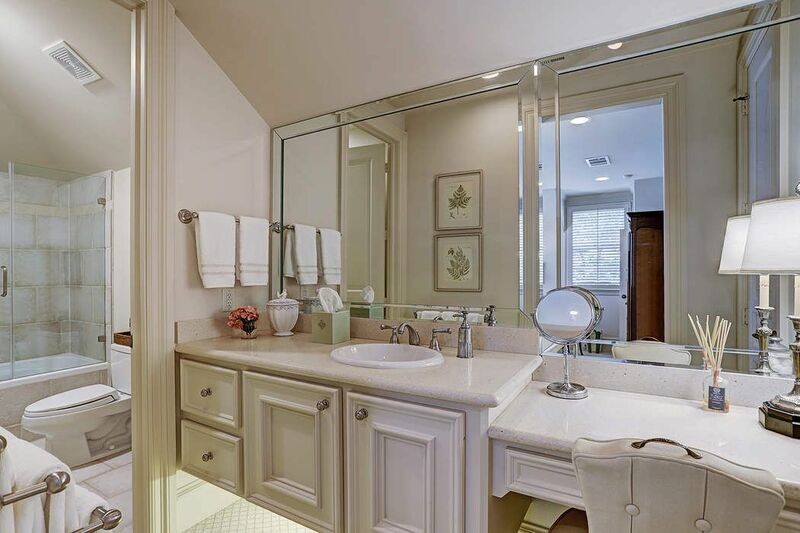 The secondary bedroom en suite bath has raised cabinetry with under mount lighting, seated vanity area and combination tub/shower with custom glass door enclosure. Third floor bedroom with en suite bath or flex space has two closets, 100% wool needlepoint carpeting and plantation shutters. Look how large this area is! You can use it as a study, media room, fitness area or 3rd bedroom as it has an en suite bath. 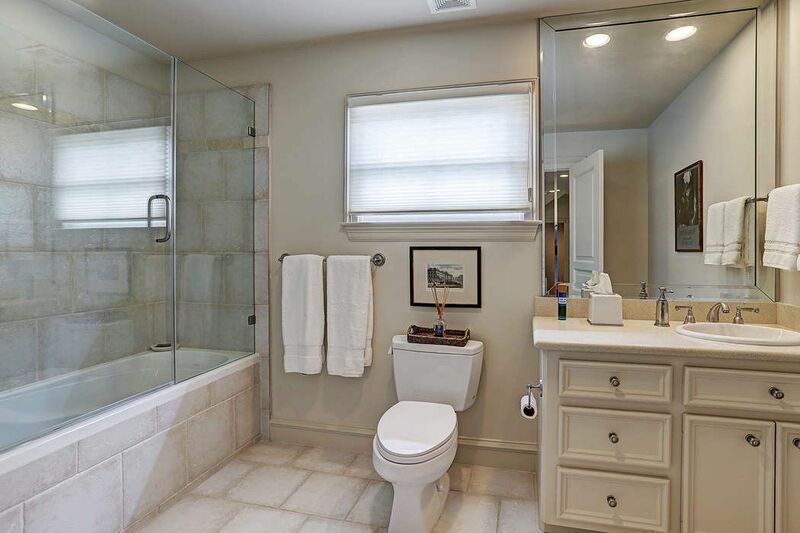 Third floor en suite bath is spacious and has a custom tub/shower combination glass door enclosure. With a remote control operated retractable awning, you can enjoy the outdoors sans sun. 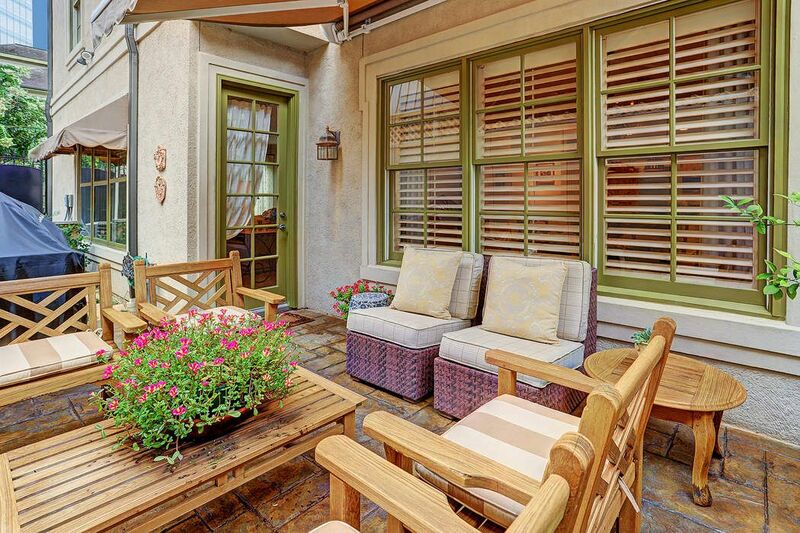 Slate pavers, privacy walls and lattice make this a lovely place to enjoy the outdoors. Outdoors at 1239 Wynden Oaks Garden Drive! Need I say more? 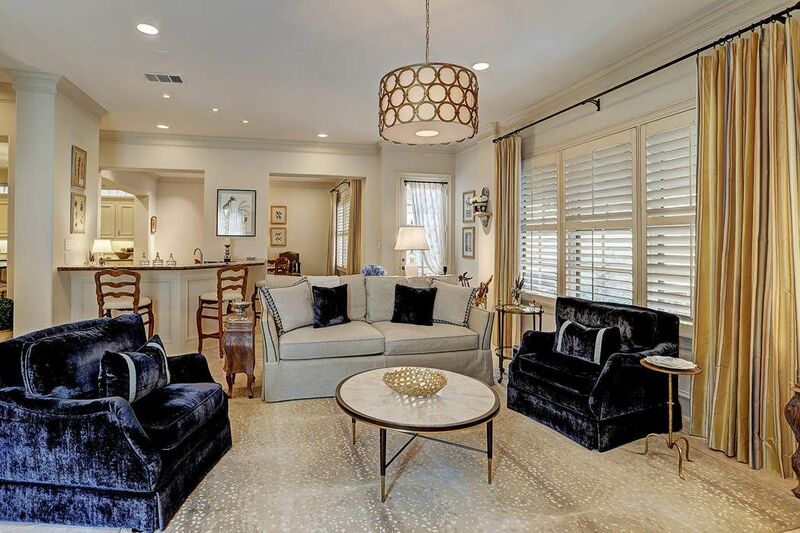 $960,000 3 Bedrooms3 Full / 1 Partial Baths4,328 sq. 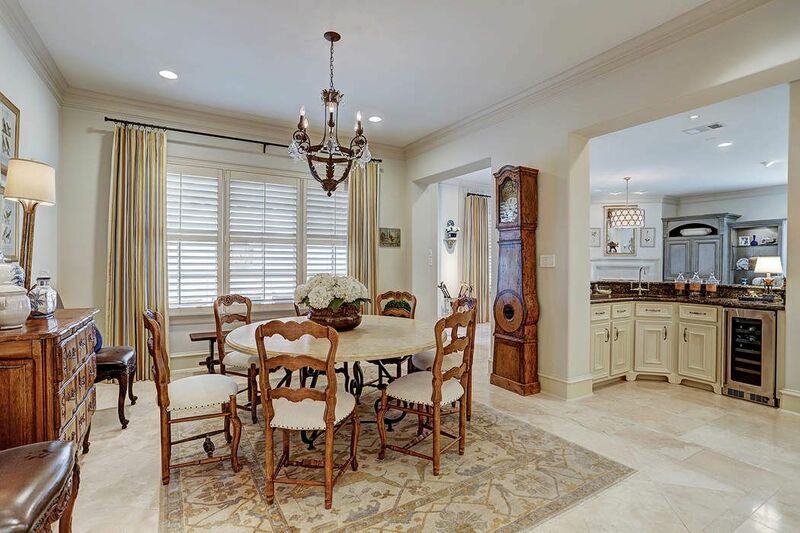 ft.
Tanglewood area patio home speaks fluent French. 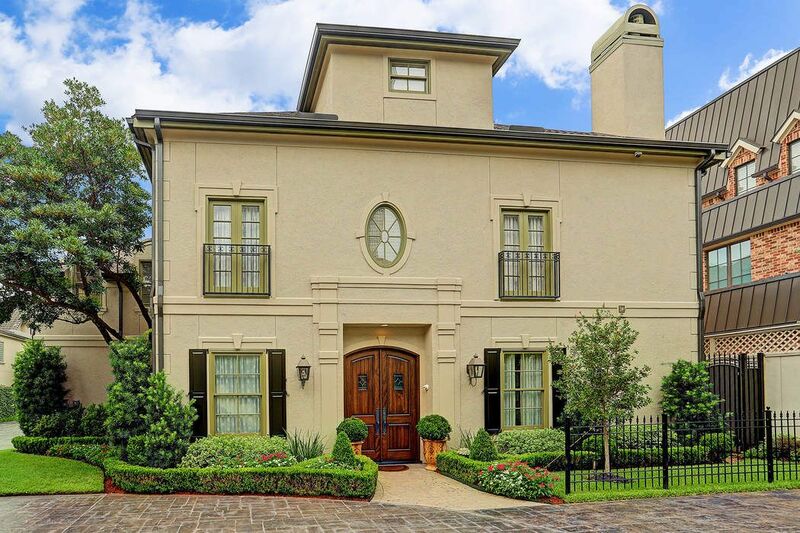 Exuding European village warmth without giving up city sophistication, this distinctive residence speaks of charm and refinement. 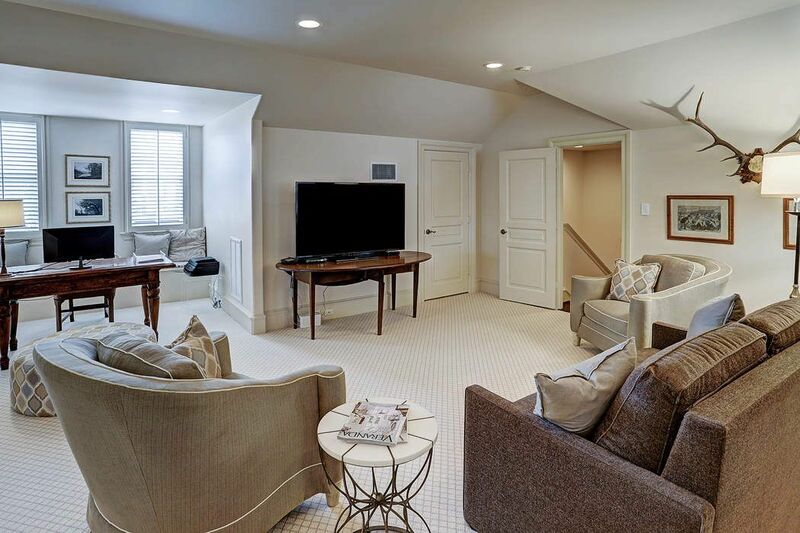 Custom built by Brian Thompson, the open concept provides a versatile use of space for living and entertaining. This elevator capable home has touches like double solid mahogany arched doors, cast-stone gas log fireplaces, travertine stone floors, hardwoods and wool needlepoint carpeting, LED lighting and custom plantation shutters lend a sense quality while custom draperies and chandeliers afford their own bit of sparkle. A harmonious mix of cosmetic amenities balances the home’s hardworking structure and mechanicals. 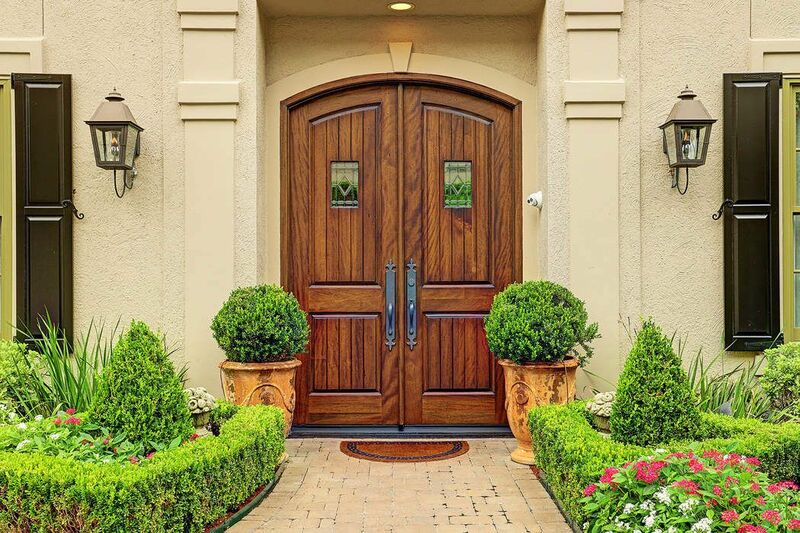 Some updates are roof and gutters, HVAC, entire home water filtration system and water softener, Sentricon termite system, two newer 50-gallon water heaters, video camera security system, sound system and high-end appliances. 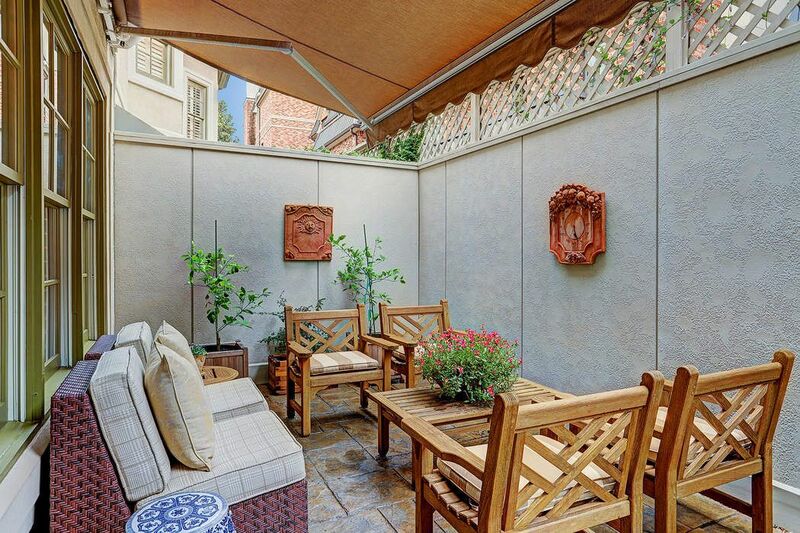 Private patio fitted with remote operated retractable awning makes the perfect venue for al fresco dining. Elegance awaits.